1) Take one of the Eyepins and thread on one Rondell Spacer and two Flat Flower Beads. 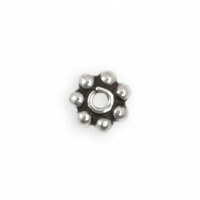 Follow this with a Abalone Shell bead, two Flat Flower Beads and another Rondell Spacer. Make a simple loop with the remaining Eyepin wire and cut off any excess wire with your Side Cutters. Repeat this step to create four beaded Eyepins. 2) Open up the ten Jump Rings with your Chain Nose and Round Nose Pliers. 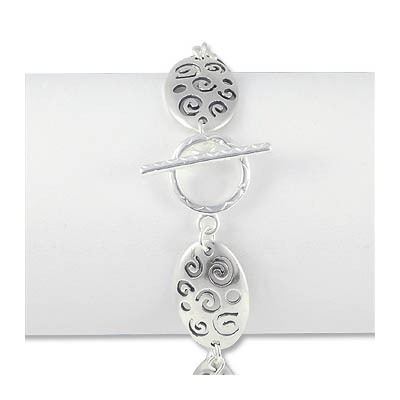 Use one of the open Jump Rings to connect one half of the Toggle Clasp to one of the connector loops on one of the Sterling Silver Swirl Connector. 3) Use one of the open Jump Rings to connect one of the beaded Eyepins to the connector loop on the other side of the Sterling Silver Swirl Connector from step #2. 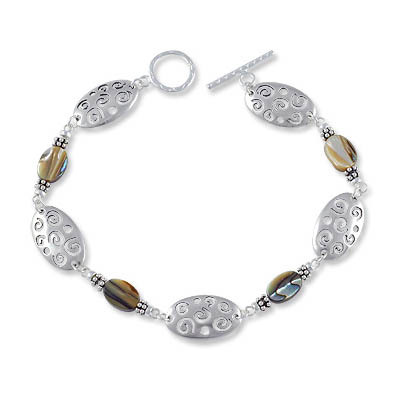 Now, connect an open Jump Ring to the other half of the beaded Eyepin to another connector loop on another Sterling Silver Swirl Connector. Repeat this step until all of your beaded Eyepins are connected to the Sterling Silver Swirl Connectors. 4) Use the last open Jump Ring to connect the end of your beaded Eyepin chain to the other half of the Toggle Clasp. Done!